This is Karl von Spruner's 1855 map of Africa from the Arab conquests in the 8th century up to the arrival of the Portuguese in the 14th century. Much of southern Africa shows only rivers and the note, in very light typeface, 'unknown land of the heathens' (roughly translated from the German). Light blue color-coded boundaries encompass the Iberian peninsula, northern Africa, The Middle East, Saudi Arabia, and Iran, and historical dates appear throughout. The place name 'Vinland' appears in the upper left corner of the map, denoting North America as it was known to Medieval geographers. This would make a nice companion piece to Plates 11 & 13, showing Africa up to the Arab conquests in the 7th century, and again since the beginning of the 15th century. Relief is shown by hachures, and the finely engraved detail throughout exhibits the exquisite craftsmanship for which the Perthes firm is best known. 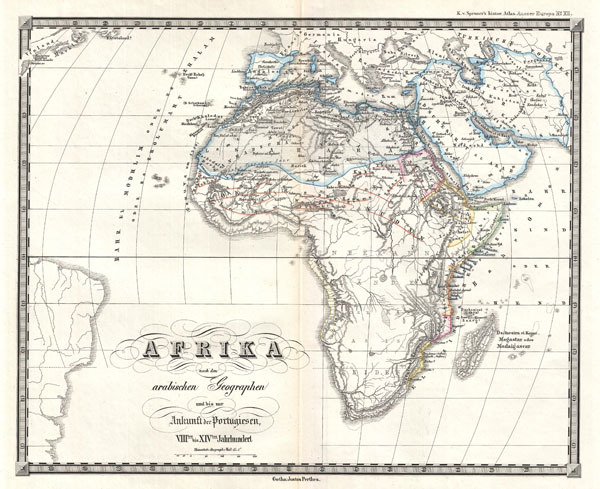 Justus Perthes published the map as plate number 12 in Dr. Karl von Spruner's 1855 Historisch-Geographischer Hand-Atlas zur Geschichte Asiens, Africa's, America's und Australiens, also known as Histor. Atlas. Ausser Europa.